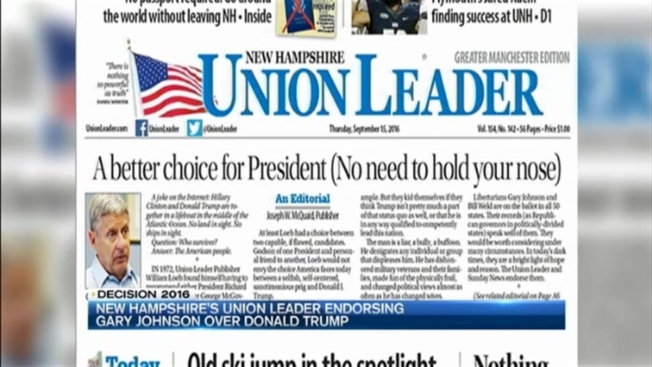 New Hampshire's largest newspaper, the Union Leader, is breaking with a 100-year tradition of backing the Republican presidential nominee. The Granite State paper has endorsed Libertarian candidate Gary Johnson and his running mate, former Massachusetts Gov. William Weld. In an editorial published online Wednesday, publisher Joseph W. McQuaid wrote that rather than picking between the "lesser of two evils," the Union Leader has chosen to endorse Johnson and Weld. "In today’s dark times, they are a bright light of hope and reason," McQuaid wrote. Of Trump, who is headed to New Hampshire Thursday, the paper denounced his candidacy, calling the businessman a "liar, a bully, a buffoon. He denigrates any individual or group that displeases him." Though his most blistering attacks were reserved Trump, McQuaid hardly spared Democratic nominee Hillary Clinton, calling her "a selfish, self-centered, sanctimonious prig." The Union Leader is the latest conservative-leaning newspaper to break from tradition and refuse to endorse the Republican nominee. The Dallas Morning News and Houston Chronicle have both announced their endorsement of the democratic ticket, backing Clinton and Kaine, while North Carolina's Winston-Salem Journal and Virginia's Richmond Times-Dispatch have recommended Johnson.